This flag is an example of a "wreath within a square" pattern, with the four large corner stars anchoring an outer "box" of stars. The box contains a double wreath of stars, which in turn surround the large center star. The bold large corner stars, and the mass of inner stars which fill the canton make it a particularly beautiful medallion flag. 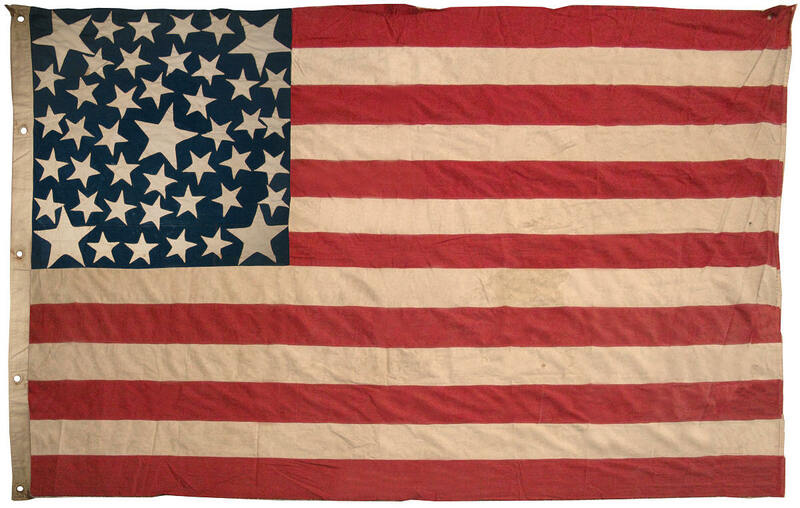 The entire flag is made of cotton, with machine stitched stripes and hand stitched stars. The hoist of the flag is made of thick cotton and has five circular whip-stitched grommets, each sewn around an inner ring to maintain its shape and rigidity. The flag is in exceptional condition for its age. It is a wonderfully graphic and beautiful late period medallion and is among the very best of all surviving examples of the 44 star count. Learn more about flags with Center Stars.